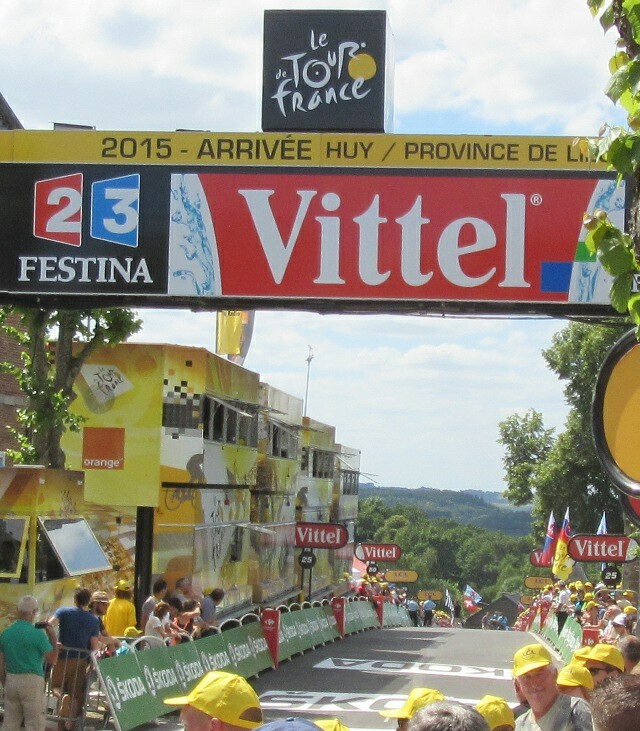 It is now four days since I cycled to Huy to watch the Tour de France stage finish at the summit of the legendary Muy de Huy. 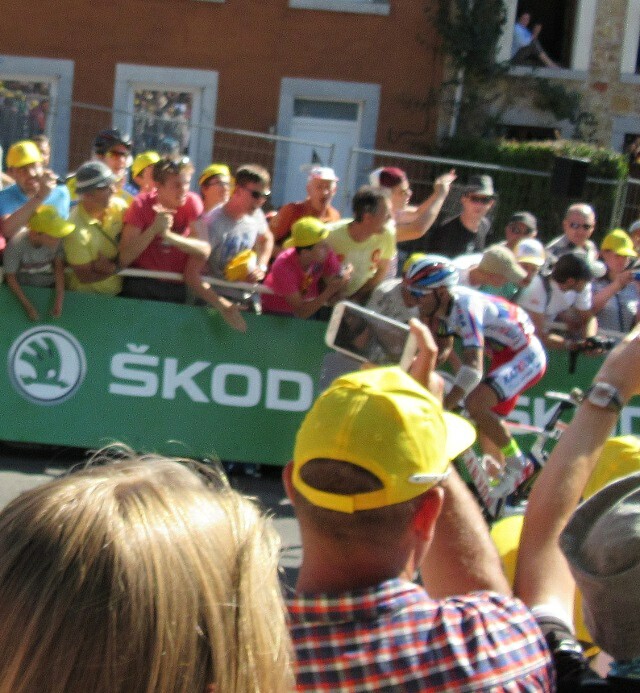 In the way of these things the excitement of the Tour has rolled on with eventful stages almost every day. So looking back I can write about the things that stick in my mind, the ones that will remind me “I was there” in years to come. That can sometimes be quite hard with bike racing, at the end of the day it can be 3 hours beside the road, a blur of colour and it is all gone. It is a sport that really was made for television, the unfurling of the stage on the screen and the helicopter shots are something we take for granted, I know many first time watchers can be a bit disappointed by the racing itself, except perhaps on the stages with some form of grand spectacle like the mountains. 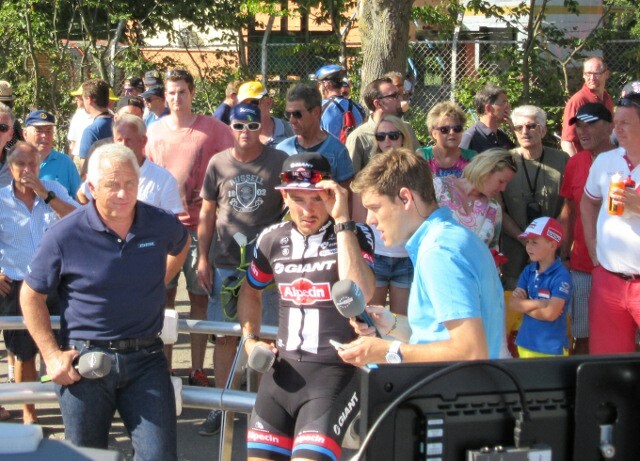 That is the reason why Monday’s stage 3 across Belgium was written in to my diary almost as soon as the Tour route was published, I knew I could make it a great day out as soon as I saw it. 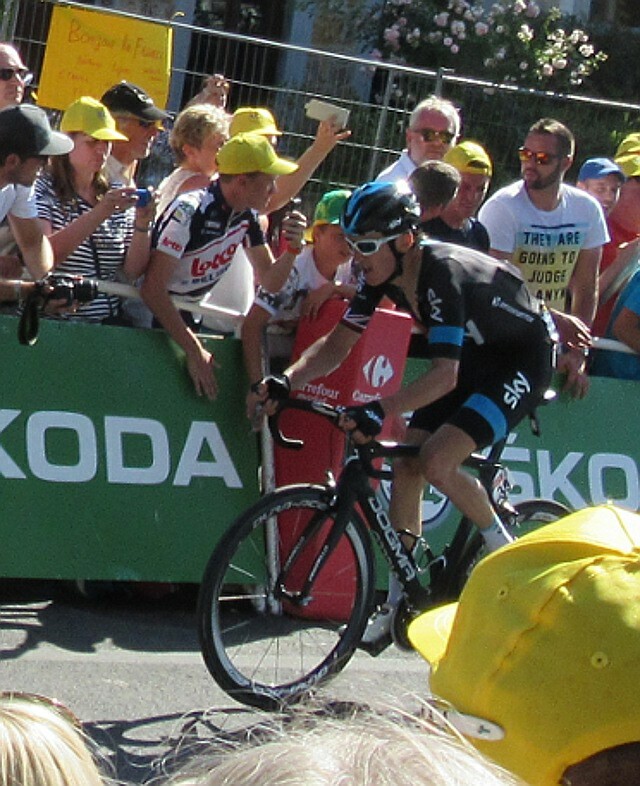 First off I knew I could just have a brilliant day’s cycling, regardless of any racing. In fact I could ride my own personal tour stage. 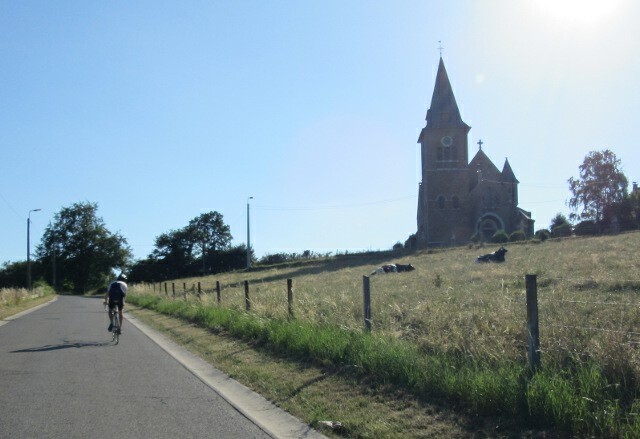 150km trip across Belgium – check. 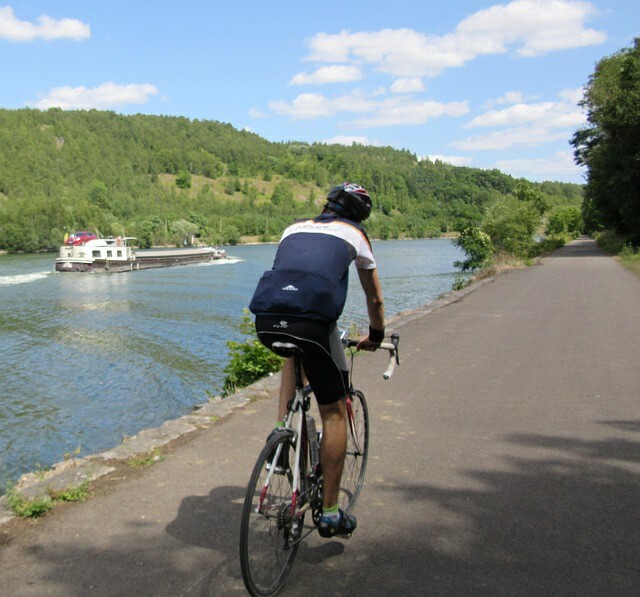 2 or 3 times up the steep sides of the valley of the Meuse – check. Secondly the stage finish at the top of the Mur is hard enough to break up the pack, it might just be possible that I could see an important development in the race or a win by one of the real stars, even this early in the Tour. And I know from my previous trip to Huy to watch the Fleche Wallonne during the spring classics season that this is a wonderful atmosphere and setting for watching, the side of the Chemin de Chappelles (Path of the chapels) is lined with people and the summit area is extremely well organised with big screen, food, bars and any other needs for sports fans. Ad so it almost turned out. The ride itself was excellent. I was joined by Thomas from our occasional riding group of transport specialists that meets for events and rides. He is riding the Etape du Tour next week so he was in final training mode, adding a further 50 kilometres to his day by riding from the Brussels suburbs to meet me in Ottignies. Together we bowled reasonably well across the flatter sections of central Wallonia on a glorious sunny day. Route planning was a bit disjointed because my “thingy” – the damned GPS – decided to have an off day, but fortunately I still had paper maps to back myself up. 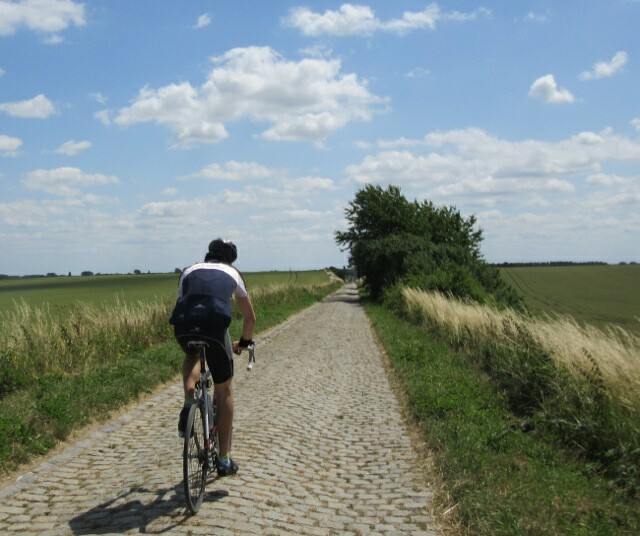 The obligatory section of cobbles was actually a stunning stretch of arrow straight road that could have been there since the Romans. 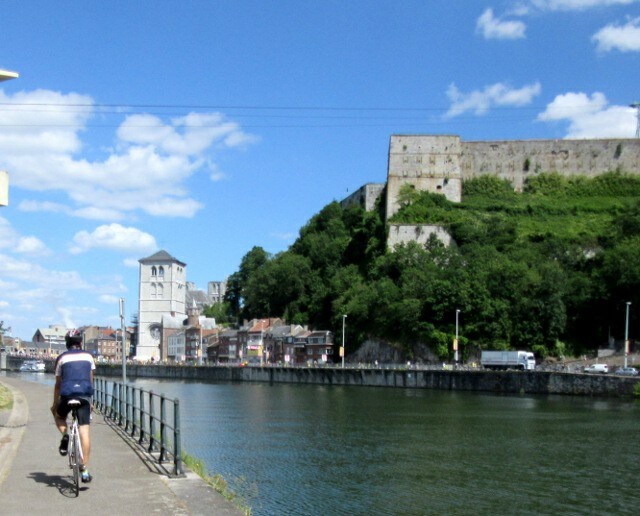 We dropped into the steep sided valley of the River Meuse about 25 kilometres west of Huy and made our way almost alongside the Tour route by using the riverside cycle paths until we reached Huy. As we got nearer and nearer the numbers of people grew and you could sense a draw towards the town. The most successful part of my route planning was that I had perfectly worked out the way to bypass the closed roads of the tour and we were able to follow the team buses, press cars and race operations people up the parallel road to the stage finish and pop out almost right on the finish line. That climb was quite hard enough, the fact that it isn’t the famous Mur (wall) told us just how much steeper the stage finish is. Once out of the valley we flew back to Ottignies in the wonderful glow of an orange tinted evening. 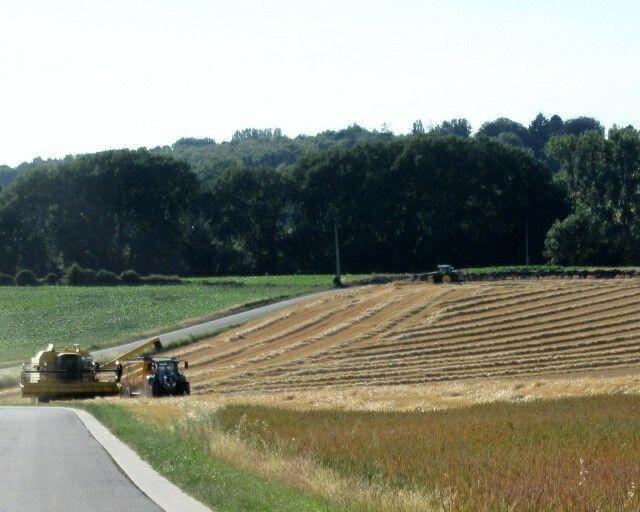 The weather had become so still the wind turbines stopped turning, the farmers were working late bringing in the harvest and the landscape glowed as we whizzed through sleepy villages all the way back. I would regard this as a great day’s riding with an excellent destination even without the Tour de France, so definitely worth the day off. The Tour stage itself will also be one that will stick in the memory for a long time, but perhaps not for expected reasons. If Chris Foome wins the tour by just a handful of seconds I can suggest “I was there when the race was won” because it could be his impressive second place on the Mur that sealed it, behind climbing star Joaquim Rodríguez. It was so congested around the stage finish that we didn’t have the best of views of the riders, but it was certainly possible to pick out the stars and join the hearty applause for everyone who put on a show, even if some were just cruising to the top. 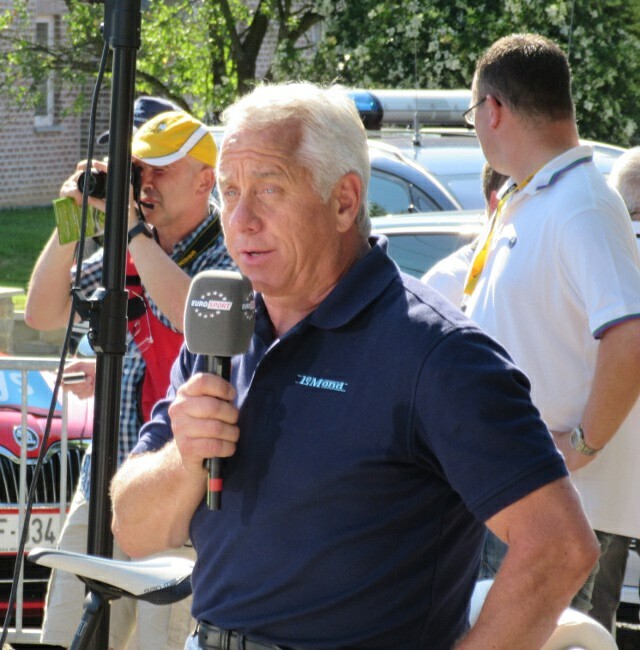 After the finish the accessibility of the Huy course was also apparent as humble spectators could get up close to the press camp with the regular TV stations just holding their interviews under canopies or out by the road, giving us a sight of some other legends of the sport like Greg Lemond who were working with the TV crews. 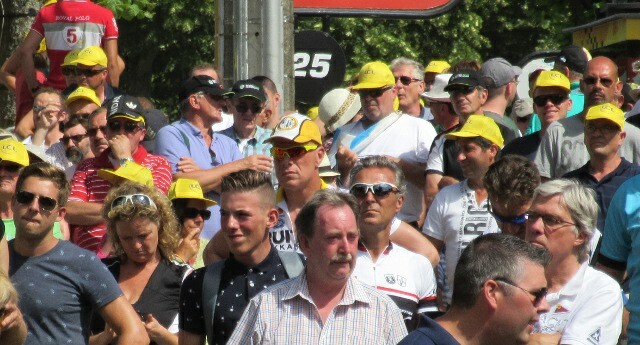 But on this occasion by far the biggest cheers were reserved for the riders at the back, because this was one of those days when anyone who has ever done cycle racing or long distance cycling knows that they are watching some of the toughest people in sport. A big crowd were gathered round the big screen watching the final hour of the race and many more were listening to the speakers churning out commentary all the way down the hill. And then collectively every person present went “oohh” as they sucked in their breath and paused for a moment, because at over 60 kmph somebody touched a wheel and a huge crash swept through the peloton. The footage has now been replayed many times and it doesn’t get any less dramatic with a replay. Up at the finish line the crowd applauded the decision of the race management to neutralise the race, not always the result expected from sports fans but people here just know that this was out of the ordinary. Concern was writ large on the faces. 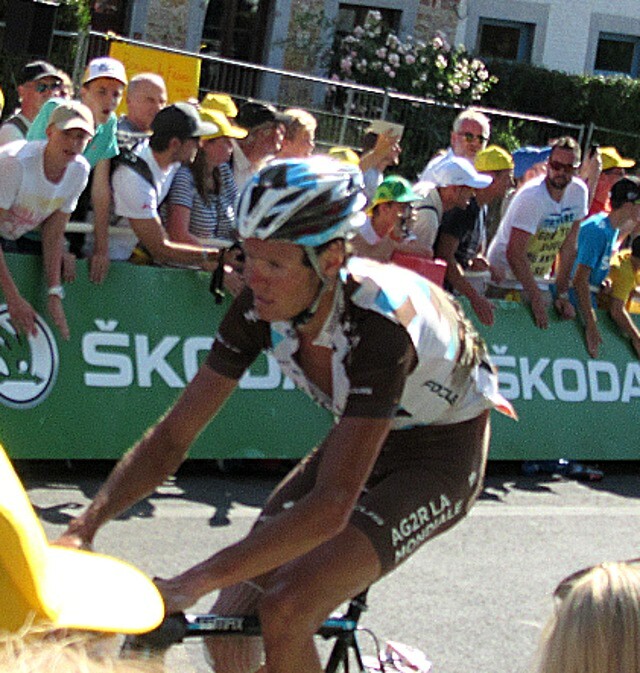 And then we watched on the screen as riders like yellow jersey wearer Fabian Cancellara battled to stay with the pack despite his obvious pain and tough Aussie Michael Mathews rode in with what later proved to be two broken ribs. By the time the race came to the finish these characters were scattered over nearly ten minutes of separation and we could see individually the battered bodies and torn clothing. Incredibly after that crash only four riders failed to get back on their bikes and ride to the finish and only one or two more dropped out overnight. We can ride their routes, climb the hills, buy their bikes but never, ever have I been able to imagine the ability of pro bike riders to get up after crashes and just ride on. And the fans knew that, so they shouted and cheered and beat the barriers for every battered body that climbed in front of us, right to the end. 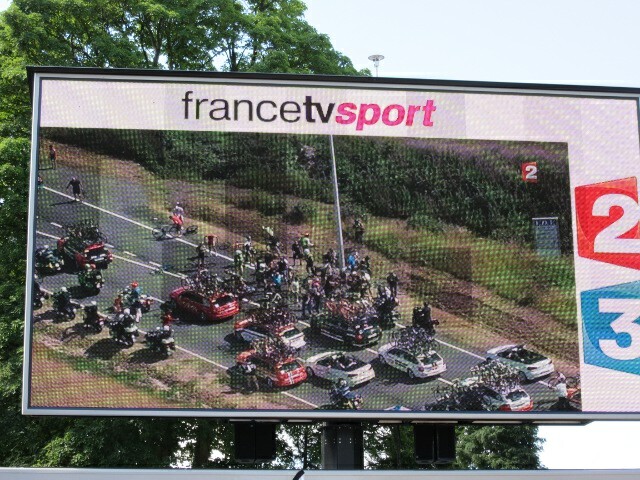 Another reason why I would chose watching cycling over football any day. Will this day live long in the memory? Oh yes for the ride, possibly for the race but definitely for the indomitable spirit and comradery of the cycling world. Great day out, and now for another 14 days of being glued to the TV to see it all unfurl. 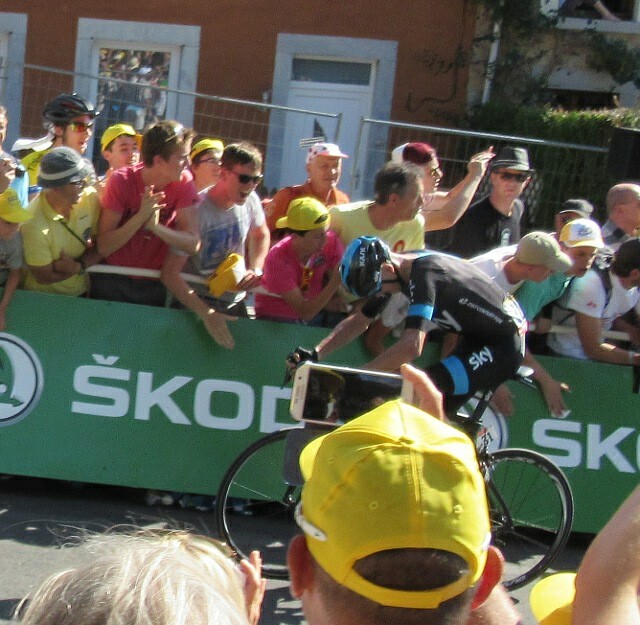 This entry was posted in Cycle racing, Great rides, Life in Belgium, Musings and tagged Belgium, Chris Froome, cycle racing, cycle touring, cycling, Fabian Cancellara, Fleche Wallonne, Huy, Tour de France, Wallonia by kevinmayne. Bookmark the permalink. A super account Kevin – reminding me of my first tour with school mates in 1952 riding a borrowed Raleigh with three speed Sturmey Archer – but it sowed the seeds for some serious touring ,Audaxing etc from age 40 ! My first continental tour took me to the TDF too, across the Jura and the Alps until we got to L’Alpe d’Huez in the days of Fignon, Kelly, Zoetemelk. Not my first time at the tour, but I discovered a whole new world on that trip.